Trading on margin carries high risk. Always consider carefully your objectives, trading experience, and risk level before trading on margin. Prior to reading and following this article, please go through our Knowledge Base section in the Trading collection to know what Margin trading is and how it can affect your portfolio. Opening a position in Margin trading is basically placing an order in Margin trading mode. Once the order is matched and filled (fully or partially), the position is opened. The size of the position corresponds with the filled quantity of this order (until you close some or all of it). 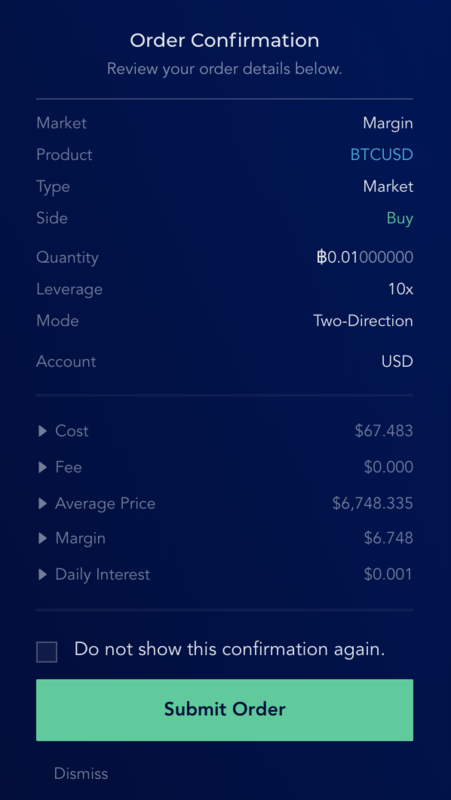 Once you're logged in to Liquid, select Margin to go to Margin trading UI. Select your trading product by hovering the cursor on the top bar. 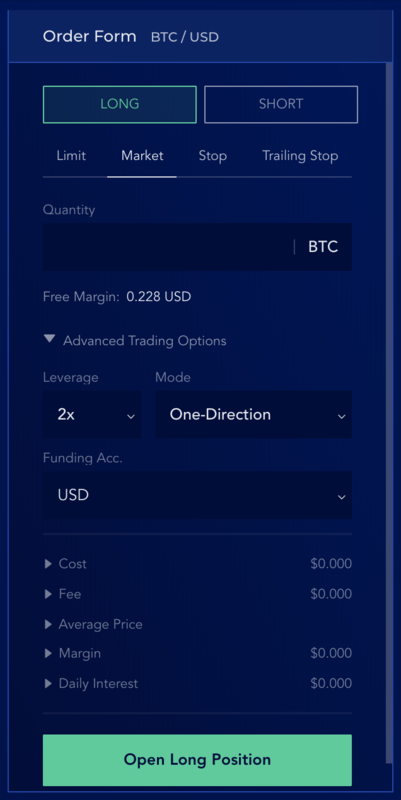 Below is a screenshot of the Order Form in Margin Trading mode, with Advanced Trading Options expanded. All these indicators can be customized to your liking. Expand all the drop-down lists to see all details of the order you're about to place. Screenshots are taken in real-time so price might have moved slightly. 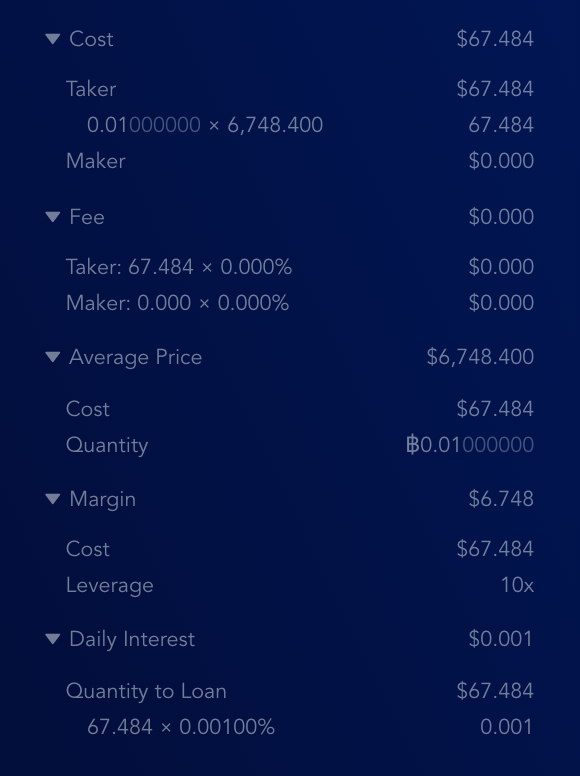 According to the screenshot above, by opening this position, you are borrowing $67.484 with daily rate 0.001%. Used margin (what you need to have at least in your balance) is $6.748. To open the position, click Open (Long) Position. System will prompt you to confirm everything again. Click Submit Order to go through, or Dismiss to return. You just opened a position! The position can be monitored in Positions panel. Expand the Columns drop-down menu to see all the indicators you may need. 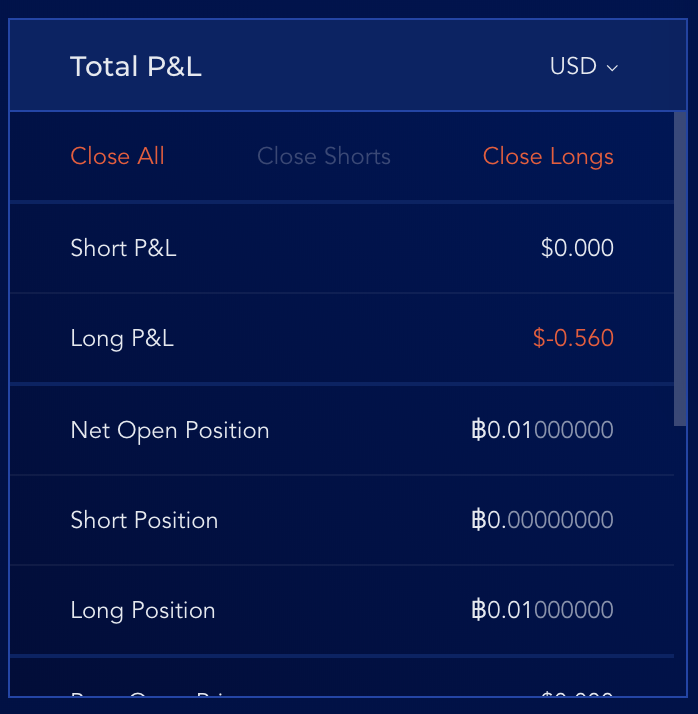 Filter through your positions using the Funding Account marker (USD) and Position status (Open/Closed). 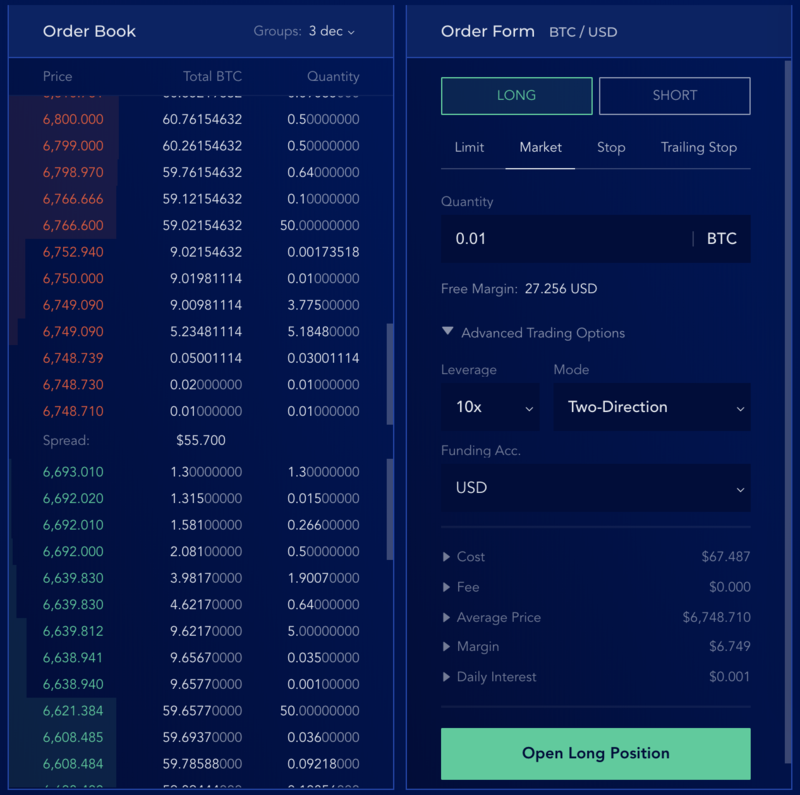 Since we used a Market order to open the position in this article, the Orders panel on the left will also be populated. P&L (profit & loss), Margin Used, and Available Margin can be monitored using the Total P&L panel on the right side of the dashboard. 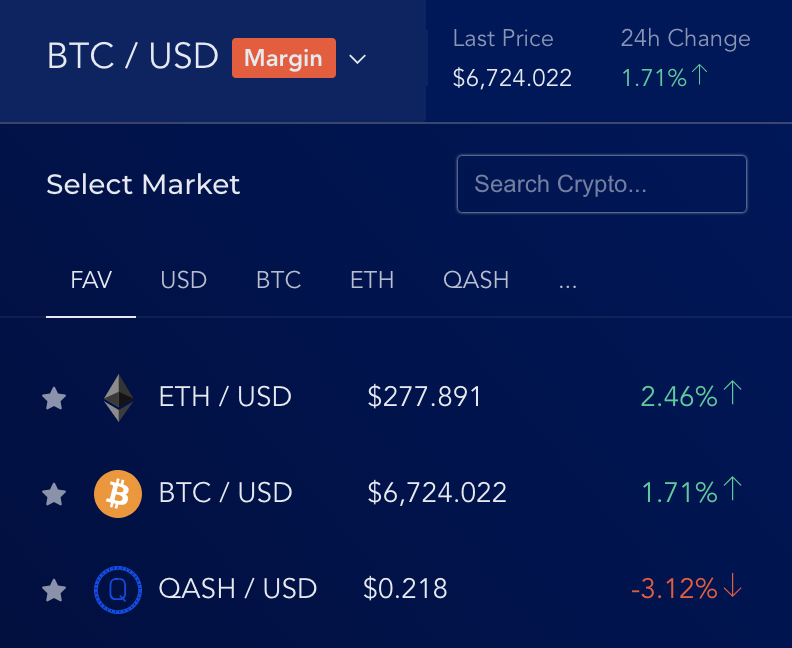 Scroll down within the panel to see more indicators of your position. Setting Take-Profit and Stop-Loss for your position. Close the position (when price moves in your favor).